Lump Sum vs. Dollar Cost Averaging: Which Is Better? Some people go swimming by diving into the pool; others prefer to edge into the water gradually, especially if the water's cold. A decision about putting money into an investment can be somewhat similar. Is it best to invest your money all at once, putting a lump sum into something you believe will do well? Or should you invest smaller amounts regularly over time to try to minimize the risk that you might invest at precisely the wrong moment? Periodic investing and lump-sum investing both have their advocates. Understanding the merits and drawbacks of each can help you make a more informed decision. Periodic investing is the process of making regular investments on an ongoing basis (for example, buying 100 shares of stock each month for a year). Dollar cost averaging is one of the most common forms of periodic investing. It involves continuous investment of the same dollar amount into a security at predetermined intervals--usually monthly, quarterly, or annually--regardless of the investment's fluctuating price levels. Because you're investing the same amount of money each time when you dollar cost average, you're automatically buying more shares of a security when its share price is low, and fewer shares when its price is high. Over time, this strategy can provide an average cost per share that's lower than the average market price (though it can't guarantee a profit or protect against a loss in a declining market). The accompanying graph illustrates how share price fluctuations can yield a lower average cost per share through dollar cost averaging. In this hypothetical example, ABC Company's stock price is $30 a share in January, $10 a share in February, $20 a share in March, $15 a share in April, and $25 a share in May. 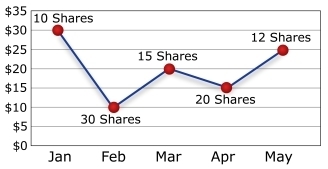 If you invest $300 a month for 5 months, the number of shares you would buy each month would range from 10 shares when the price is at a peak of $30 to 30 shares when the price is only $10. The average market price is $20 a share ($30+$10+$20+$15+$25 = $100 divided by 5 = $20). However, because your $300 bought more shares at the lower share prices, the average purchase price is $17.24 ($300 x 5 months = $1,500 invested divided by 87 shares purchased = $17.24). In addition to potentially lowering the average cost per share, investing a predetermined amount regularly automates your decision-making, and can help take emotion out of your investment decisions. And if your goal is to buy low and sell high, as it should be, dollar cost averaging brings some discipline to that process. Though it can't help you know when to sell, this strategy can help you pursue the "buy low" portion of the equation. Also, many people don't have a lump sum to invest all at once; any investments come out of their income stream--for example, as contributions to their workplace retirement savings account. In such cases, dollar cost averaging may not only be an easy strategy; it may be the most realistic option. Maybe you're considering rolling over an IRA or have just received a pension payout. Perhaps you've inherited a large amount of money, or the mail-order sweepstakes' prize patrol has finally shown up at your door. You might be thinking about the best way to shift your asset allocation or how to invest the proceeds of a certificate of deposit. Or maybe you've been parking some money in cash alternatives and now want to invest it. In cases like these, you may want to at least investigate the merits of lump-sum investing. Several academic studies have compared dollar cost averaging to lump-sum investing and concluded that, because markets have risen over the long term in the past, investing in the market today tends to be better than waiting until tomorrow, since you have a longer opportunity to benefit from any increase in prices over time. For example, a 2009 study by the Association of Investment Companies found that an investor who put a lump sum into the average British investment company at the end of April 2008 (talk about bad timing!) would have been down 30% one year later. Someone who invested the same total amount divided over 12 months would have been down only 7%. However, when the study examined the previous 5 years rather than a single year, the lump-sum investment made in April 2004 would have been up 26% by April 2009, compared to the periodic investment strategy's loss of 10% over the same time. Several U.S. studies over several decades reviewed overall stock market performance and reached a similar conclusion: the longer your time frame, the greater the odds that a lump-sum investment will outperform dollar cost averaging. Caution: Past performance is no guarantee of future results. Think about whether you'll be able to continue your investing program during a down market. The return and principal value of stocks fluctuate with changes in market conditions. If you stop when prices are low, you'll lose much of the benefit of dollar cost averaging. Consider both your financial and emotional ability to continue making purchases through periods of low and high price levels. Plan ahead for how you'll manage the temptation to stop investing when the chips are down, and remember that shares may be worth more or less than their original cost when you sell them. The cost benefits of dollar cost averaging tend to diminish a bit over very long periods of time, because time alone also can help average out the market's ups and downs. Don't forget to consider the cost of transaction fees, which can mount up over time with periodic investing. The lump-sum studies reflect the long-term historical direction of the stock market since record-keeping began in 1925. That doesn't mean the markets will behave in the future as they have in the past, or that there won't be extended periods in which stock prices don't rise. Even if they do move up, they may not do so immediately and forever once you invest. Even if you don't have a large lump sum to invest now, you may be able to save smaller amounts and invest the total in a lump sum later. However, many people simply aren't disciplined enough to keep their hands off that money. Unless the money is invested automatically, you may be more tempted to spend your savings rather than investing them, or skip a month--or two or three. Even seasoned investors have difficulty timing the market, so ignoring fluctuations and continuing to invest regularly may still be an improvement over postponing a decision indefinitely while you wait for the "right time" to invest. Don't forget that though diversification alone can't guarantee a profit or prevent the possibility of loss, a lump sum invested in a single security generally involves more risk than a lump sum put into a diversified portfolio, regardless of your time frame. In the end, deciding between lump-sum investing and dollar cost averaging illustrates the classic risk-reward tradeoff that all investments entail. Even if you're convinced a lump-sum investment might produce a higher net return over time, are you comfortable with the uncertainty and level of risk involved? Or are you increasing the odds that you won't be able to handle short-term losses--especially if they occur shortly after you invest your lump sum--and sell at the wrong time? It's important to know yourself and your limitations as an investor. Understanding the pros and cons of each approach can help you make the decision that best suits your personality and circumstances. All investing involves risks, including the potential for loss of principal, and there can be no guarantee that any investment strategy will be successful.